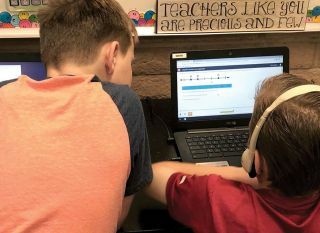 Valerie Wirth’s math students in the Amphitheater School District in Tucson, Arizona, learn using UpSmart. Why Did You Start Using It: “I’ve taught math for 28 years,” says Valerie Wirth, from the Amphitheater School District in Tucson, Arizona. When Wirth heard about Edgenuity during an in-service program, she knew it would give her and her students new learning opportunities. She was able to pilot a new program in her district using Edgenuity’s UpSmart. Valerie Wirth, math teacher in the Amphitheater School District in Tucson, Arizona, tracks student progress with UpSmart. Students at Newman-Crows Landing USD using Fuel Education’s Stride program. Why Did You Start Using It: “We were looking for an online platform that would address the standards, engage students, and provide teachers with real-time data,” says Kim Bettencourt, Director of Curriculum and Instruction at Newman-Crows Landing (CA) USD. “Stride also has the Progress Monitoring Assessments (PMAs) that can be administered four times per year.” Students love Stride’s gaming component, and teachers can show areas of growth and challenge based on the standards. Unique Features: Julia Cope, third-grade teacher at Bonita Elementary in Newman-Crows Landing USD, values the variety of reports for both teachers and parents. The information enables her to adapt her teaching, and “I also have the ability to build my own quizzes,” she says. Cope and Bettencourt both emphasize that Stride features an informative and user-friendly dashboard, with appealing graphics. “Also, Stride can be used at home,” Bettencourt says. Jenny Lynn Hatter, Chief Academic Officer of Harrison County Schools, reading to elementary students. Why Did You Start Using It: “We needed to find an assessment that was systemic and sustainable,” says Kevin Goralczyk, principal at Our Lady of Hungary School in South Bend, Indiana. In addition, “NWEA provided all types of professional development” so teachers could learn to read and interpret the data correctly and also gain strategies for teaching more effectively with techniques that “activate students as a resource for others and themselves.” This training launched a culture shift, Goralczyk says. Across the board, educators value MAP Growth’s consistency, reliability, and flexibility. Amy Black, first-grade teacher, leads centers in her classroom at Our Lady of Hungary School. Outcomes: Our Lady of Hungary has shown “exponential growth according to the Indiana State Standards,” says Goralczyk. But the outcomes go deeper than test scores. “Our test scores have increased, but more importantly I have seen a great deal of growth in several of our student groups,” says Hatter. “The data sets the stage for invaluable instructional conversations,” says Wilson, and instruction is more focused and targeted as a result. Northwood School in Berryessa Union (CA) School District. Why Did You Start Using It: “The online math program that we had wasn’t meeting students’ needs,” says Andrew Derrick, principal at Northwood School in Berryessa Union (CA) School District. “The scores were stagnating and students were getting bored.” So the district began looking for a solution that kept up with the changes in the Common Core and included the language component that’s so important for problem solving and critical thinking. PowerUp is helping students in the Section 504/Dyslexia Department at SAISD close the college and/or career readiness gap. Unique Features: “Students like that they’re in charge of their learning,” Gonzalez says. They choose a strand to work on daily and enjoy collecting “streaks” for correct answers. Teachers appreciate that the data PowerUp provides is comprehensive and easy to interpret, which helps them plan for prescriptive and targeted instruction. A student at Visible Men Academy using Curriculum Associates’ i-Ready. Why Did You Start Using It: Visible Men Academy, an all-boy, tuition-free public charter school in Bradenton, Florida decided to implement i-Ready “because we wanted a tool that would inform our instruction, adapt to the individual needs of our students, and provide specific data so that our parents would understand how their student(s) were performing,” says Tiffany Mickens, Assistant Head of School.